Catch comes to us from Charles Candy, a division of the rather generically named Associated Brands Industries Ltd. A product of Trinidad & Tobago, this bar features crisp rice, caramel and chocolate. The sweet smell is immediately appetizing. Cutting it in half, the caramel is visible, but thicker than what’s found in American candy. The rice provides just the slightest crunch to contrast the chocolate and caramel. This bar is like a Nestle crisp bar with caramel. The only negative about this bar is that it contains artificial flavors otherwise it’s a stand out candy. Check out this silly commercial/advert for Catch from the 80s. Hi Monica- Their website doesn’t provide much info but I put the question to them. I will respond once I hear back. 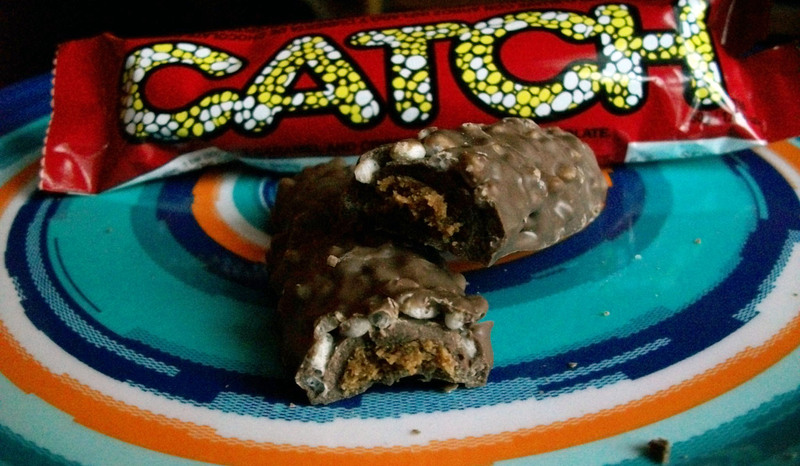 Is this catch candy bar made with genetic Ingredients? Hi Victoria. I don’t know the answer but have contacted the company – I assume you mean GMO ingredients? It doesn’t say on the website though I can find out.